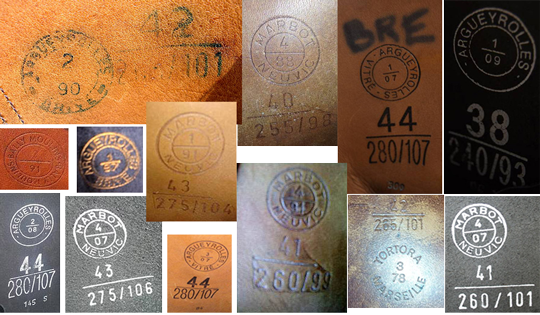 The marking label is also one of the most characteristic features, which allow to distinguish the real French military boots from all other "fakes" and copies. Usually the out-soles of the "fakes" have no marking at all, or the markings are very roughly made, primitive, often blurred. On the contrary, the lettering and logos on the original boots are very clear. 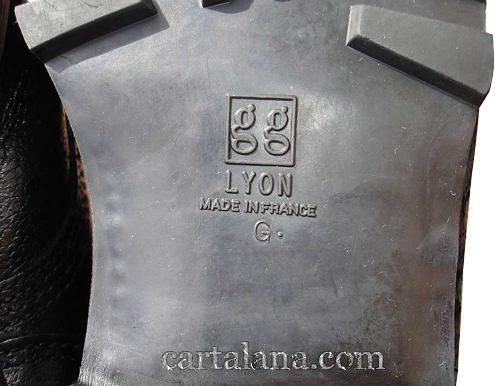 One can see the example of the manufacturer's marking on the out-sole: "gg" is the name of the manufacturer and Lyon is the city, where the boot factory is located. 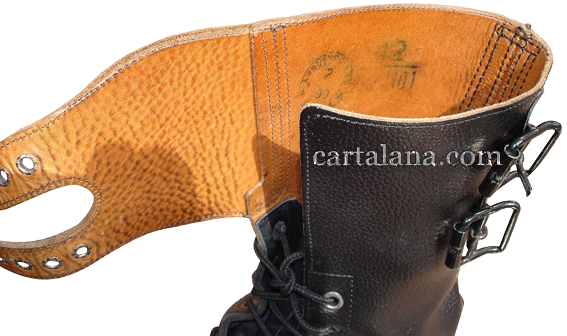 The inscription "Made in France" confirms the French production of these boots. The Lyon-based company "gg", for example, also produces the out-soles for Swiss army model M-91 boots. 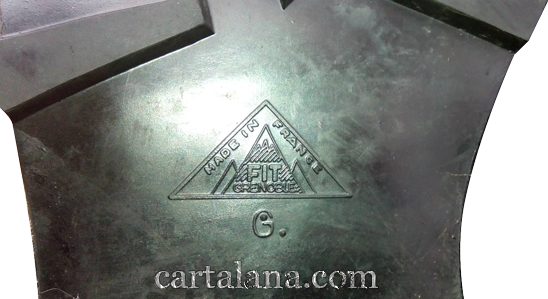 As it was told before, the marking (month and year, name and location site of the manufacturer),) is placed inside the boots, on the top inner side. 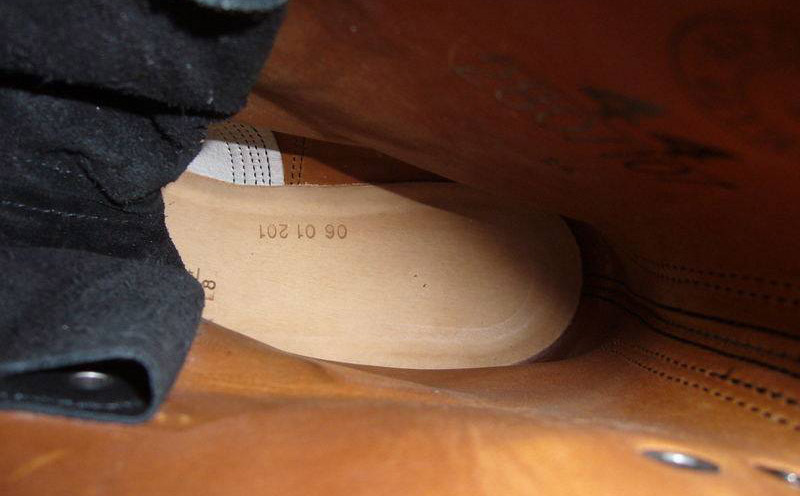 This information is duplicated under the removable insole , along with serial and inventory numbers. 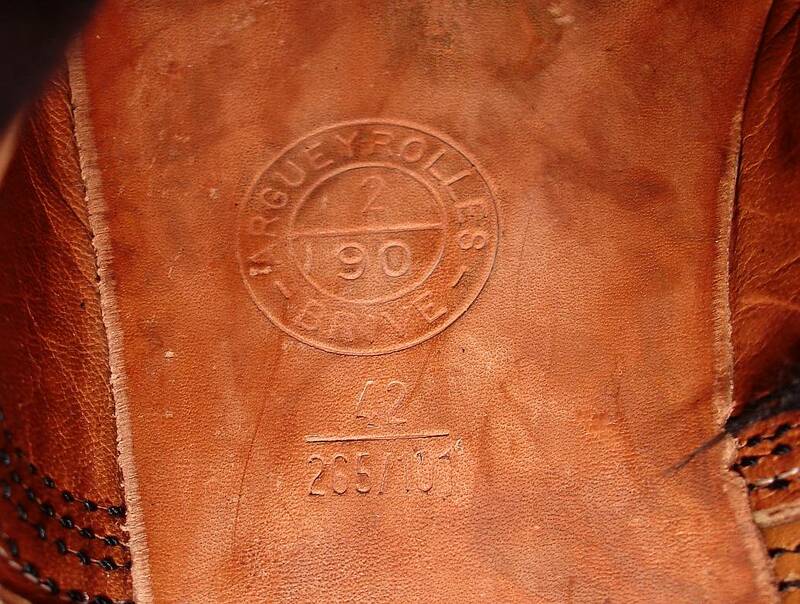 Among the manufacturers (cities of boots factories) of the French military boots the most common are: Marbot (Neuvic) and Argueyrolles (Brive or Vitre), more rare producers are Bally (Moulins) and Tortora (Marseille). 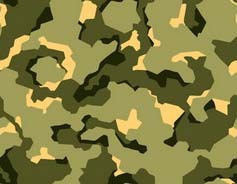 The French army pants from the uniform set (the models F1 (olive) or F2 (CCE - Central European Camouflage) are quite tight and not to be worn tucked into the boots. They are to be worn outside the boots, for this purpose the low-most sides of the trouser legs feature the sewn-on elastic bands. 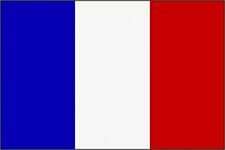 According to the French military tradition, the elastic bands should keep the lower parts of the trouser legs just between the two buckles of the boot's clamps at the top of the boot. 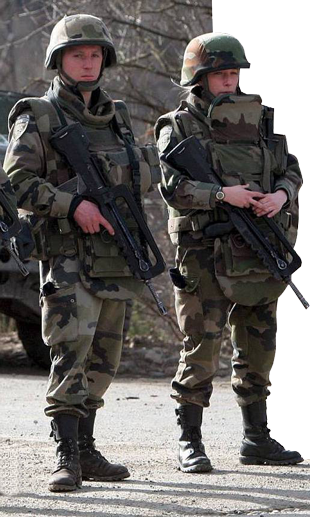 However, on some photos one can see the French military personnel with the pants tucked into the boots.